Conspirator Brock's Basement: DC's Filler before "The New Rejiggered 52"
DC's Filler before "The New Rejiggered 52"
This week marks the start of the big push from DC comics called "The New 52" or as I like to call it "The New Rejiggered 52". There will only be two single issue titles shipping this week: Flashpoint #5 and Justice League #1. 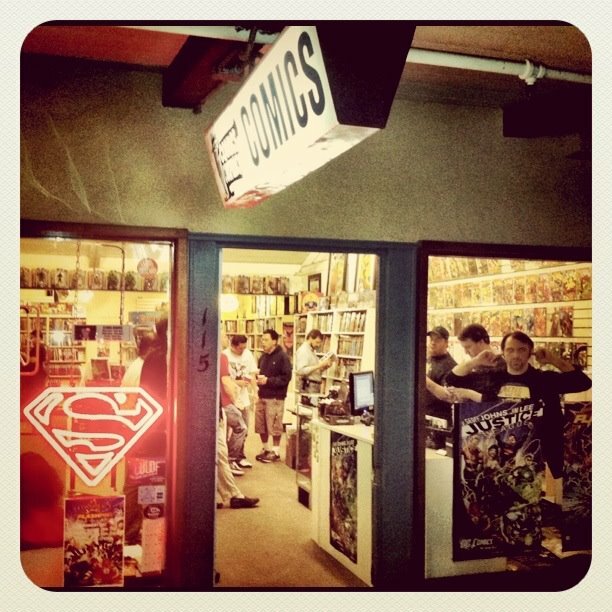 Which many stores are being allowed to sell at midnight (12:01 AM), and Comics Conspiracy will be one of those stores. So to be ready for this epic event I finished all of my DC single issue reading over the weekend, and with the exception of a few titles I found a majority of the DC books as of late to be poor filler issues that lead to nothing. Detective Comics is one of the main exceptions. Scott Snyder has done an fantastic job on with his Batman stories and the last story arc is proof of that. Overall though I have not been impressed with how DC is moving forward into this new rejiggered era. With the fizzling out of so many titles and the spring board for everything being an alternative reality story it seems that until we get into the first few issues of "The New Rejiggered 52" titles we will have no idea how we get from the current DC to the new rejiggered DC. But maybe we aren't suppose to have a clear idea of this path. But according to DC the key to this transition is supposedly in Flashpoint #5 on two double splash pages. This is a huge task to accomplish, and we will see if it hits the high mark and explains enough to get us from one DC to the other, or if it leaves a bad taste in our mouths just like the filler of issues that have been coming out for months now have left in mine. I am hopeful that this move works out for DC Comics and the comic book industry in general, and despite my disappointment with the renumbering of Action Comics and Detective Comics I am ready to see where this "New Rejiggered 52" takes us. 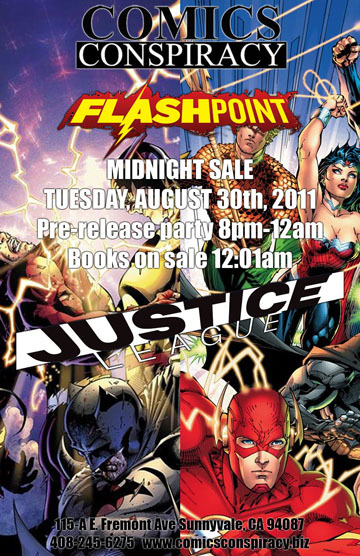 So be sure to come down to Comics Conspiracy Tuesday night for the midnight sale of Flashpoint #5 and Justice League #1. It will be a fun night of excitement, disappointment, confusion, fear, hope, food, drinks, and good old comic book talk with your local conspirators. Hope to see you Tuesday night and don't forget that we will have a moment of silence for the death of long running sequential comics from DC before midnight. What do u mean by "allowed to sell"? It's Wednesday at that point so shouldn't u be able to sell whatever u want that's new for the week? Items that have a release dates are normally viewed as being availible for sale when the business selling them opens on the day they are released. Things like midnight sales are promotional gimmicks from product companies which allow businesses to sell an item before their actual opening time. Where do you get your fix?